BURLINGTON — What a difference a week makes. After last week’s somewhat under-rehearsed Green Mountain Chamber Music Festival faculty concert, Wednesday’s concert at the UVM Recital Hall proved the technical and artistic mettle of the leaders of this summer chamber music school for high school and college pianists and string players. Still, the highlight of the program was a guest artist. Violinist Paul Huang, joined by fine faculty pianist Dmitri Shteinberg, delivered a powerful and sublime performance of César Franck’s 1886 Sonata in A Major. While Shteinberg’s performance was expert but a bit reserved, Huang played with a depth seldom heard in contemporary violinists, let alone one who is 27 years old. The Franck Sonata is a major work, and Huang delivered each and every note personally and with feeling. Not a note was sloughed off, yet the performance was a cohesive statement. He plays with an irresistible rich and pliable sound, thanks in part to a rare Guarneri del Gesù violin, with clean and precise articulation. Despite a couple of rushed passages, denying some of the power, Huang and Shteinberg’s performance was a powerful and beautiful musical journey. Huang made his Vermont debut three years ago on Rutland’s Passages at the Paramount series, performing the same Franck sonata. (He appeared on the Barre Opera House’s Celebration Series the following season.) The growth that Wednesday’s performance revealed makes him an artist rather than merely a virtuoso. 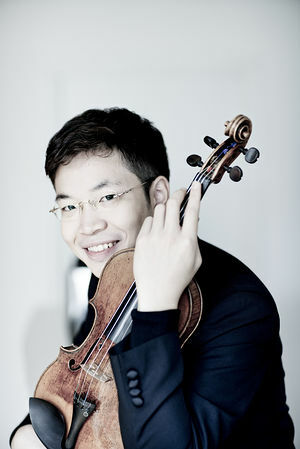 With continued success in concert performances around the world, Huang has the possibility of becoming a great violinist. The other major work on the program was Gabriel Fauré’s brilliant and sensual Piano Quartet No. 1 in C minor, Op. 15. Pianist Hiromi Fukuda, violinist Janet Sung, violist Daniel Sweaney and cellist Robert Jesselson plumbed the depths of this masterpiece, playing with passion and a real sense of ensemble. The slow movement, Adagio, was gorgeous. The concert opened with minimalist composer Steve Reich’s 1967 “Violin Phase” for four amplified violins. Fine playing by Carolyn Stuart, Lina Bahn, Sung and Jubal Fulks couldn’t make this trite and dated work — basically a 15-minute repetition of a theme among the four with some variation at the end — anything more than an amusing exercise. Reich, who was once a part-time Vermont resident, has written much better. Still, the audience seemed to enjoy it.